Comment: Recent Music Heroes is back again at a notch of the roster of Mimi Records. 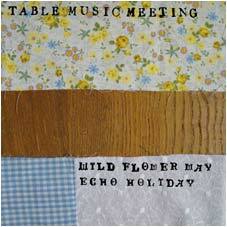 This time the Japanese collective Table Music Meeting`s 2-track/single issue provides many associations and creates a fine frame of mind. Although the release is described as “electronica” at the Portuguese imprint`s site it is half true at least only. Mostly it is guitar driven folk-tinged music which frequently draws upon droning, however, being saturated with minute yet delicate electronic and free and easy glockenspiel-based fringes. Between these two components you could perceive much air to be flitting around in thereby furnishing the exertion with the organic slide. By its intention the outing could be tagged as “chill out (chill folk? )” music because it calms down the listener providing him/her a virtuous buffer against daily problems he/she encounters. Additionally I recommend to listen to the likes of Oto, Nick Rivera, Plusplus, Possimiste, 2muchachos, Junya Nishimura, Koji Maruyama.